JUNE BUG'S GOTTA EAT, TOO! As might be expected, at Hilton Pond Center we have numerous hummingbird feeders in all shapes and sizes--each hung and dutifully maintained in our never-ending effort to attract Ruby-throated Hummingbirds. Most are models made by Perky-Pet Corporation, but we have an ancient Best-1 feeder that has sentimental value and hangs in a spot visible from our office desk. It usually attracts a hummingbird or two during the day, but this week we noticed hummers had ceased coming to it--even though it still contained fresh sugar water. We were puzzled at the lack of hummingbird visitors and went out to see what might be going on. As we approached, we saw some bumps on its base and suspected Bald-faced Hornets might be monopolizing this particular feeder as they sometimes do in summer. A closer view revealed the bumps weren't made by hornets but by bugs--June Bugs to be exact--three of which were trying to get at the artificial nectar in a tiny crack where the bottle fits into the base (above). And just for the record, this 20-year-old weather-worn feeder isn't as dirty as it looks; the black stuff around the mouth of the bottle is actually a rough rubber gasket, the feeder ports are scrupulously clean, and the nectar is fresh. 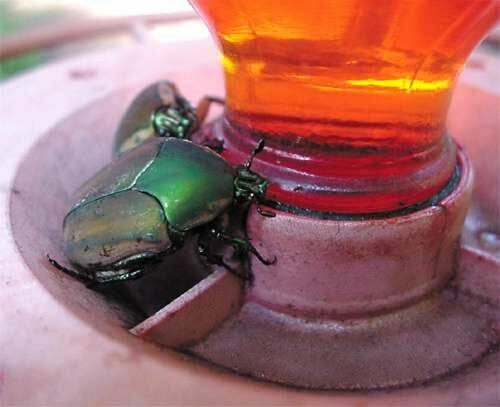 We've seen all sorts of creatures "stealing" sugar water from our hummingbird feeders--ants, bees, hornets, and Carolina Anole lizards have been the most common--but this was the first time we'd observed big beetles sipping the juice. Although June Bugs are insects they aren't really bugs, and are more correctly called June Beetles, Cotinis nitida. To clarify, beetles have hard wing covers (elytra) and are in the Coleoptera (Beetle Family), while True Bugs (Hemiptera) have exposed wings, the front wings being leathery at the base and membranous at the tip. June Beetles, as their name suggests, show up in late spring and remain active for the duration of the warm months. We ought not have been surprised that these insects were on the hummingbird feeder, for the drought year of 2002 has been a banner time for June Beetles. Just last week we parked the Center's van near an open field and were puzzled by loud thwacking noises on the outside of the vehicle; the sounds came from several frenetic June Beetles flying into and bouncing off the van, for reasons perhaps only they understood. 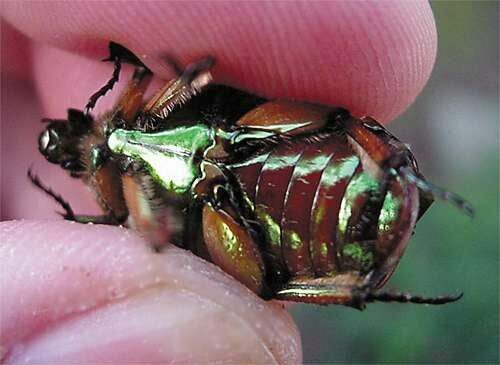 June Beetles are pleasing to the eye, with remarkable shades of metallic green on their elytra and underparts (below). Despite this pleasing appearance, they are no friends of farmers in the eastern U.S. where adult June Beetles often dine on corn, peaches, and grapes--which probably explains why they were attracted to sugar water in the hummingbird feeder. 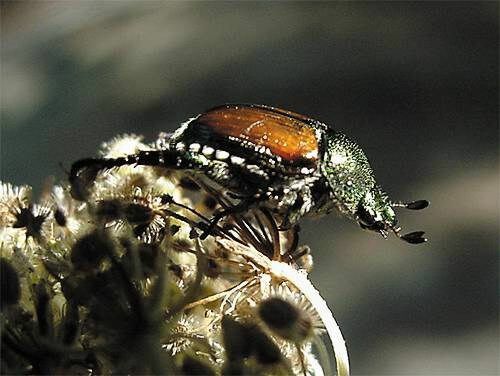 Even greater damage is caused by June Beetle larvae, which live in the soil and wreak havoc with the root systems of row crops, lawn grasses, and ornamental plants. Adult June Beetles mate in summer--perhaps the kamikazes hitting our metallic blue van thought it resembled some huge potential mate!--after which the females lay their eggs in rich soil. A June Beetle grub tunnels about in the earth for two years, sucking sap from succulent plant roots. It then forms a pupa in a chamber near the surface and finally emerges as an adult the second spring after it hatched from the egg. 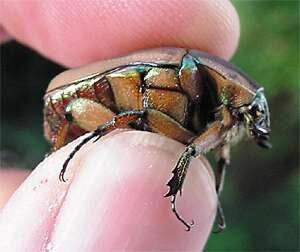 By the way, we've learned that many people confuse our native June Beetles with an even more pestiferous insect, the invasive Japanese Beetle. Both species are metallic green in color, but the non-native Japanese Beetle (left) is half the June Beetle's size and has a distinctive white "skirt" on the outer edges of its abdomen. When we took a close look at the Best-1 hummingbird feeder at Hilton Pond Center, one of the June Beetles departed immediately, while the other two were intent on getting whatever sugar water they could. We grabbed one for photographic purposes and left the last one to finish its meal. After all, it wasn't stealing that much sugar water, and there were plenty of other feeders for hummers to visit. Now if we could just get those June Beetle splat marks off the outside of our blue van . . . . 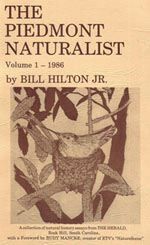 Thanks to the following fine folks for recent gifts in support of Hilton Pond Center for Piedmont Natural History and/or Operation RubyThroat: The Hummingbird Project. Your tax-deductible contributions allow us to continue writing, photographing, and sharing "This Week at Hilton Pond" with students, teachers, and the general public. Please see Support or look below if you'd like to make a gift of your own. Immature Red-shouldered Hawk perching low at water's edge on Hilton Pond.